Lil' Women: A Rap Musical. 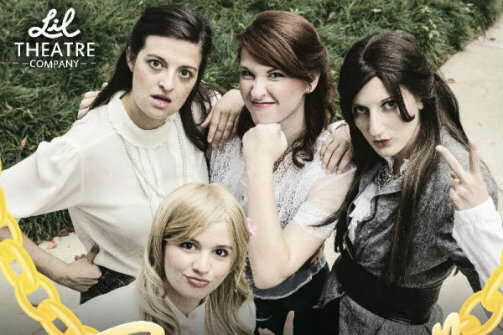 BOTTOM LINE: A fun and fast-paced show that might leave you wanting to re-read Little Women. You might see the title Lil' Women: A Rap Musical and think that the writers are trying to capitalize on the success of Hamilton by combining unlikely source material and fast rhymes, but Lil' Women predates Hamilton-mania. It may have even predicted it. During a rap battle between the oldest of the four sisters, Meg and Jo March, Jo name-drops Alexander Hamilton and Aaron Burr, though that could have been added in since the show debuted at the Orlando Fringe in 2012. Writers Lindsay Taylor and Sara Stock have picked out a greatest hits of the adventures of the March sisters, hitting on some of the most famous parts of the novels—Jo destroying Meg's hair before a party, Amy burning Jo's manuscript, Beth's death, etc. At only an hour, the musical zips along at a fast pace, but the downside of that is that sometimes it goes too fast that it foregoes smooth transitions from one scene to the next. Still, any fan of the novel will be able to fill in the gaps. But the reason to see a show called Lil' Women: A Rap Musical is of course, the rapping. Isaac Folch's lyrics are entertaining, even if they don't always rhyme perfectly, but he makes up for that with the music. Rebecca Siegel as Jo is a standout when it comes to the rapping, though the entire cast does an admirable job. Lil' Women: A Rap Musical is by Lindsay Taylor and Sara Stock. Music and Lyrics by Isaac Folch. Directed by Taylor. Choreography is by Savannah Simerly. Company Manager is Tiffany Lyn Meadows. Additional Book by Rebecca Siegel. Additional Music and Lyrics by Jordan Keyes. Costumes are by Megan Borkes, Rebecca Siegel, and Lindsay Taylor. The cast is Sara Stock, Rebecca Siegel, Megan Borkes, Toni Bonaccorso, Croix Provence, Adam DelMedico, Gregory Coleman, Justin Aldridge, and Jason Blackwater.